BANGALORE, JULY 10: Flipkart founders Mukesh and Binny Bansal (not related) have always aspired to do what Jeff Bezos, the founder of Amazon set out to do – to be the largest online retailer and a technology provider for e-commerce companies in the future. The founders share the same surname, went to the same schools, graduated in IIT Delhi and belong to Chandigarh. While both of them did not know each other well, it was sheer coincidence that brought them together as both landed a job in Amazon’s Bangalore office and that is when they decided to launch Flipkart. It set up shop in 2007 as a comparative shopping Web site, at a time when the Indian Internet user base was hovering around Rs 9,000 crore and now is playing in a market that is estimated to hit Rs 48,400 crore by 2016, according to research firm Forrester. This market growth has seen companies across the board growing. However, this growth comes with its own set of challenges for companies like Flipkart. E-retailing like normal retail is a volumes business and the margins are thin. “As competition entered, offering discounts, sacrificing their bottomline temporarily, Flipkart faced daily business operation pressures in terms of talent, tech costs and increased real estate costs involved in stocking products. 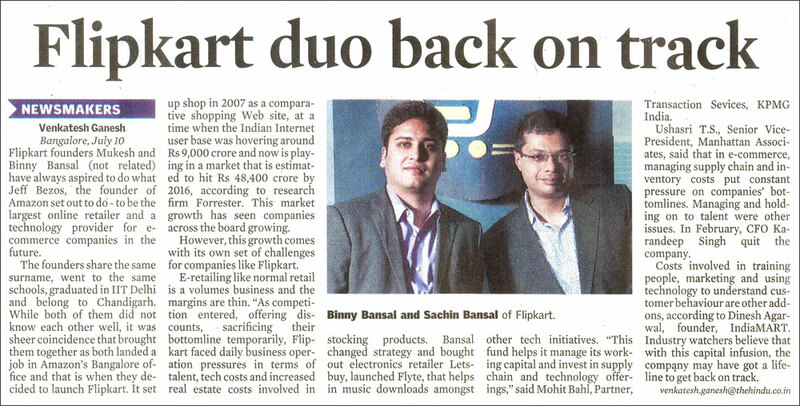 Bansal changed strategy and bought out electronics retailer Letsbuy, launched Flyte, that helps in music downloads amongst other tech initiatives. “This fund helps it manage its working capital and invest in supply chain and technology offerings,” said Mohit Bahl, Partner, Transaction Sevices, KPMG India. Ushasri T.S., Senior Vice-President, Manhattan Associates, said that in e-commerce, managing supply chain and inventory costs put constant pressure on companies’ bottomlines. Managing and holding on to talent were other issues. In February, CFO Karandeep Singh quit the company. Costs involved in training people, marketing and using technology to understand customer behaviour are other add-ons, according to Dinesh Agarwal, founder, IndiaMART. Industry watchers believe that with this capital infusion, the company may have got a lifeline to get back on track.